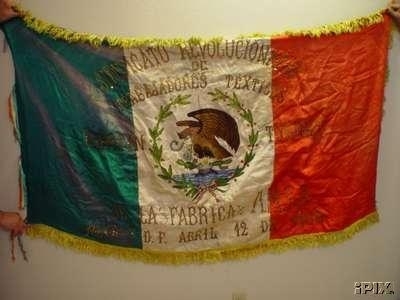 Image from Vintage Patriotic Mexican Labor Flag 1950. Reported by Rob Raeside, March 25, 2002. A large Mexican flag, flag measures 5'7" by 3'4". Flag has esquisit reminicent of folk art stitching witch reads, "SINDICATO REVOLUCIONARIO DE TRABAJADORES TEXTILES MARTIN TORRES DE LA FABRICA AMSA MEXICO D. F. ABRIL 12 DE 1950. The back is red and black signifiging the universal symbol of a strike, the green color has 3 streaks of discoloration, there is a hole on the back, it's on the black part of the flag it measures 6/10" X 3/10". Rob Raeside, March 25, 2002.